Just received a delightful email from a long-time friend. 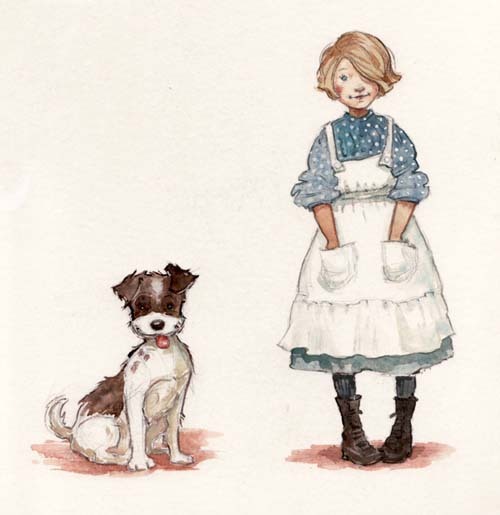 Lisze Bechtold, creator of Buster-the-Very-Shy Dog, Sally-of-the-Purple Socks (my personal fave—I’m a socks fan myself), and Edna-of-the tail-tale, a menagerie of fabulous characters. 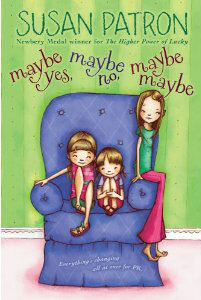 Check out her book trailer for Buster & Phoebe (above). I’ve been blown away by the book dummies turned in by the extraordinary students at my latest UCSD workshop. An amazing group that worked so hard, and shared so much, in just 9 short weeks. We’ll take a peek at some of their explorations here, so stay tuned! In the meantime, check out this book trailer by Brian Selznick on story-telling, and being Wonderstruck. 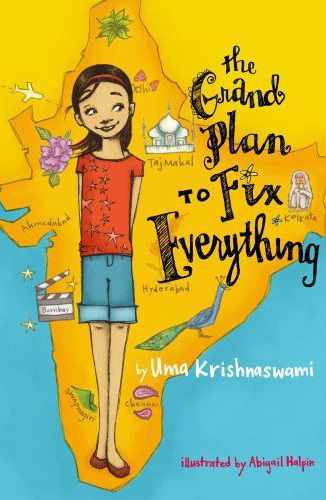 My students embarked on their own journeys, exactly as Brian Selznick’s characters did. . . .
Today we feature the illustrator for Uma Krishnaswami‘s latest book, The Grand Plan to Fix Everything (Atheneum), Abigail Halpin. 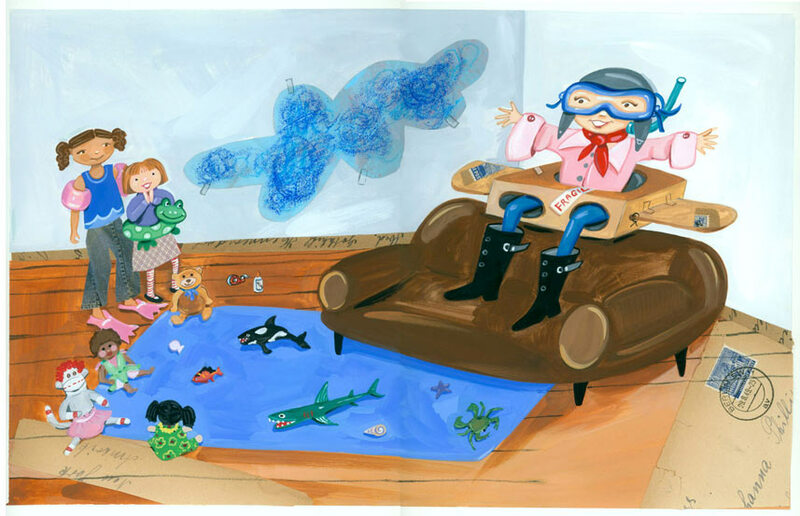 Art director Debra Sfetsios also joins the conversation, along with author Uma Krishnaswami, plus a few surprise guests. . . .
Joy Chu: I LOVE the drawings on your blog! You sketch beautifully. Is that sketch of the roller derby girl a self-portrait? And are you really “…115 pounds soaking wet…”? Joy Chu: Would you tell us a little about yourself? How did you get your start? 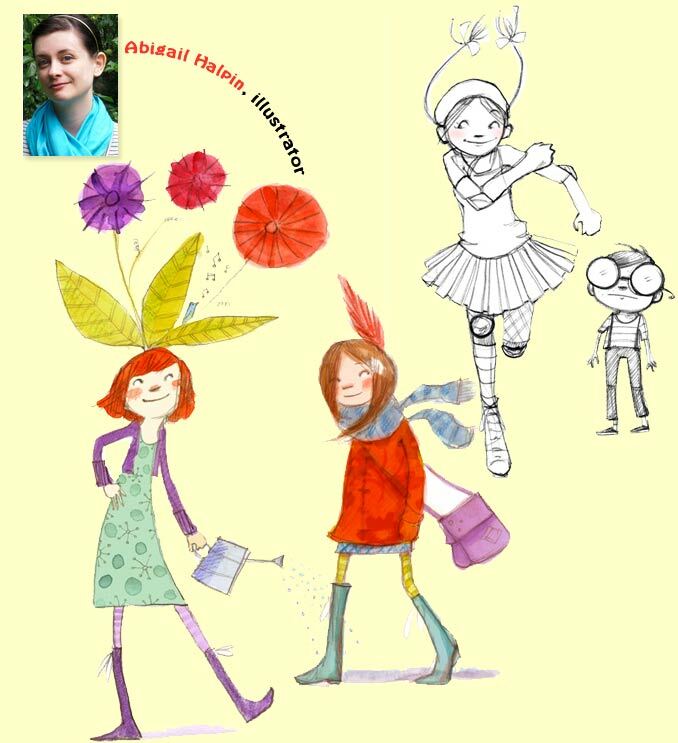 Abigail Halpin: I got my start illustrating Susan Patron’s, Maybe Yes, Maybe No, Maybe Maybe. I have a degree in graphic design and worked as a designer for several years, but my dream since childhood was to illustrate picture books. During the day I’d work on logos and websites, then come home and draw continuously. At this point, I’ve transitioned to doing mostly illustration work and I love it. Joy Chu: How did this assignment begin? 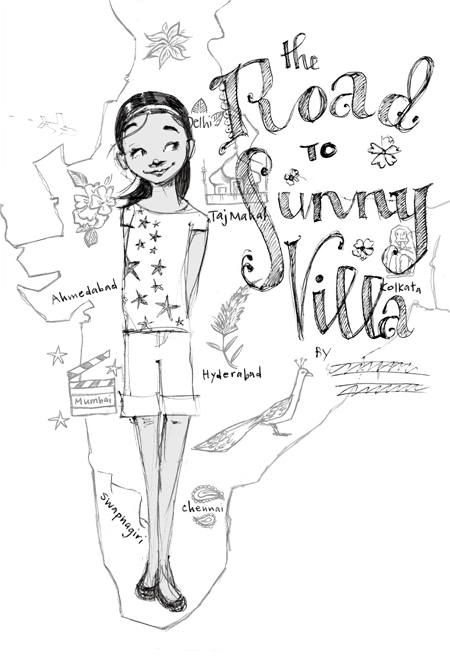 Abigail Halpin: Art director Debra Sfetsios at Simon & Schuster sent me an email asking if I’d be interested in a story about a girl who moves to India. My curiosity was immediately piqued and she emailed me a copy of the manuscript to read. I absolutely loved the story, so from here we moved on to working on character sketches, nailing down the look of Dini and her companions. Once the characters were established, sketch ideas were brainstormed and then I moved on to drawing those. 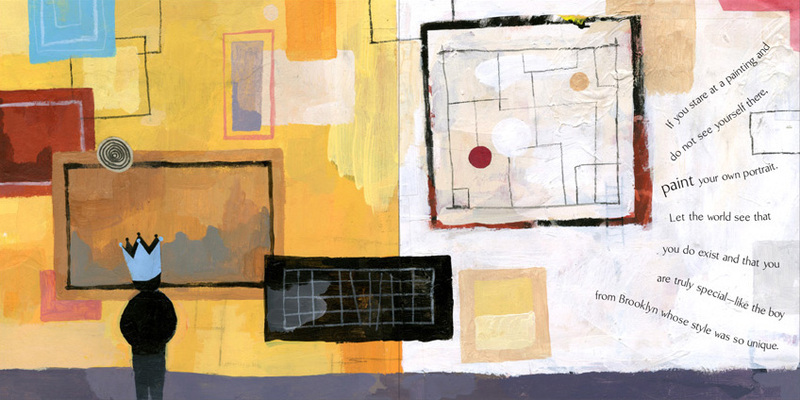 Joy Chu: In what form did you transmit sketches? Abigail Halpin: I scanned my sketches and made a PDF proof of them, which I emailed. From here, I made edits based on feedback, tweaking and fixing everything until it was okay to move to final art. Some sketches were quickly approved, others needed a bit more work, but at the end of the day, I think all of the edits really helped push the book to look great. 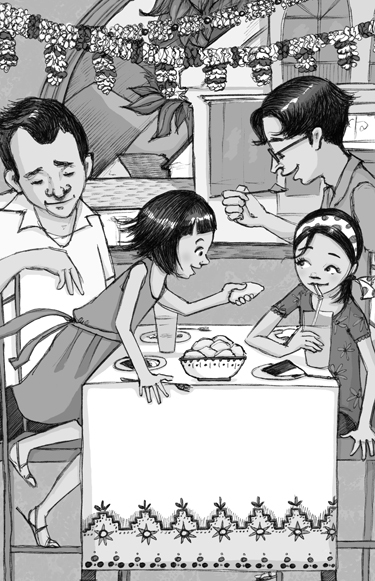 Joy Chu: The copyright page says you rendered art in pen and ink, then added color (or black half-tones) digitally. Abigail Halpin: The illustrations are done in pen and ink, then I add greyscale shades in Photoshop. For final art, I was provided with information to upload my files to Simon & Schuster’s FTP server. Before doing this though, I checked to see what file format the art department needed my files in. For this project, I provided art as EPS files. Joy Chu: The jacket: Was it your idea to have Dini appear in front of a map of India? Abigail Halpin: The idea for Dini and the map was Debra’s. I think it was a terrific concept and really tied Dini to her new home. I provided a couple different variations on the theme and it was narrowed down to the one that’s on the cover now. Abigail Halpin: I’ve sadly never been to India, so relied on books and the Internet for research. One thing I kept coming across was the vibrancy and beauty of the land and with the color palettes and decorative ornaments, I was hoping to capture that on the cover. How long did it take to complete this assignment? Abigail Halpin: I began character sketches in May 2010 and the entire project was wrapped up by early October. Joy Chu: Did you or Abigail supply the hand-lettering for the title display? Debra Sfetsios: Towards the end of getting sketches (always a good thing to do when basing art off of text, is to to make sure all text is final), I asked her to do the book and chapter titles. I thought that they would add to the fun feeling of the book. 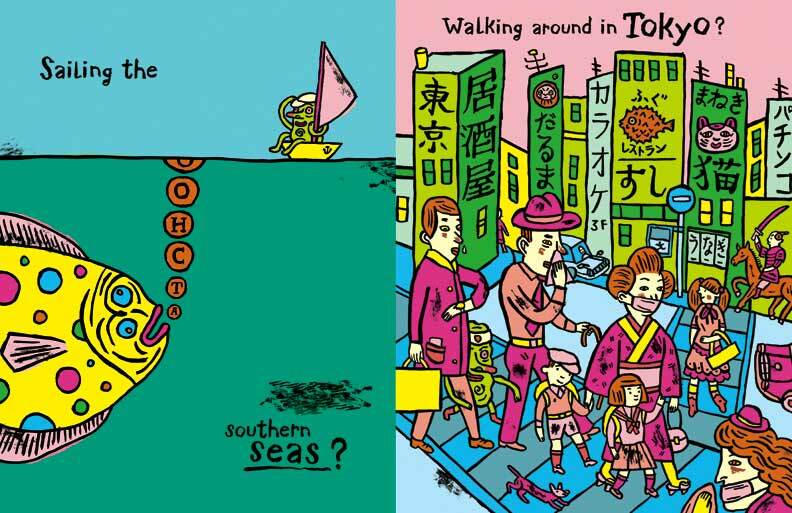 Joy Chu: I also like the decorative elements sprinkled on the title and half-title pages. Debra Sfetsios: Something that I thought could, and did add to the beauty and the ethnic aspect of the book. Joy Chu: Did you view any Bollywood movies or recommend any to Abigail? 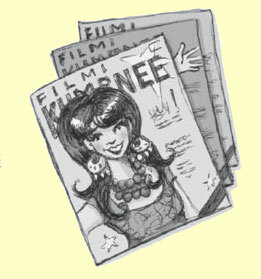 Debra Sfetsios: The editor did a great job describing the look she thought that we needed for Dolly. But no, I didn’t recommend a Bollywood movie, but certainly Abigail nailed it. Joy Chu: It was a great idea to include the map of India on the jacket. I kept wondering where Swapnagiri was! And I didn’t realize until recently that the paisley pattern as we know it originated in India. 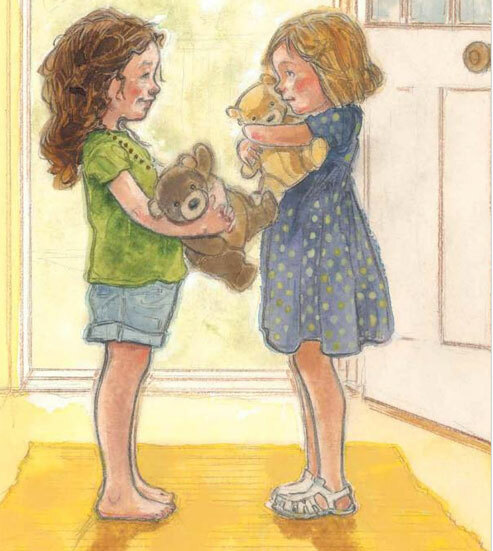 Debra Sfetsios: So much of the story had to do with the two “best” friends communicating to each other across the Atlantic, it felt crucial to add the map. It is also nice to have the characters on top of another layer…It made for a more interesting graphic. It is something that also gives the readership a true sense of “place”. Joy Chu: Were any research-like queries addressed to Uma via you and the editor? In other words, scrap material for Abigail’s use? Debra Sfetsios: Yes, we needed a lot of help for placement, the actual spellings and the newest names of cities in india. A few of India’s cites were recently renamed. Joy Chu: How was Abigail chosen for this project? Debra Sfetsios: I gathered up a few different artist choices that I felt could add to the flavor of the novel. Abigail was really the perfect choice for this age group, mainly girl readership. Her color work is vibrant and fun, great for the jacket art. 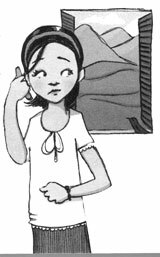 Her black and white work is just as strong as her color work, which was a major plus because we needed a number of interior illustrations as well. Then there was there were the details to work out as in the budget and the given deadlines. 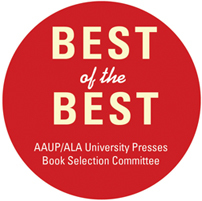 Joy Chu: Did you go over samples from your files with the book’s editor? Debra Sfetsios: I always include the editor in the choice of the artist, since she is closer to the content and the author. So I did review the samples of the artists that I pulled for this book. And in this case, we were happily on the same page with who was the best person for this project. Joy Chu: What sort of feedback did you get? What aspects were revised? Seems to me having scrap or feedback is essential for a story like this one. Did you watch any Bollywood movies to get “in-the-mood”? Any clips on youtube to recommend? 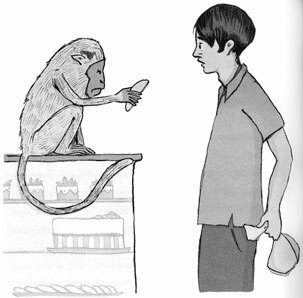 Abigail Halpin: In terms of feedback, some was ironing out the look of a character in a particular scene (i.e, making an expression more exaggerated, altering an emotion or fixing where a character might look a little off) and some was more about the accuracy of an illustration (for instance, making sure I had the right species of monkey or having Dolly’s sari wrapped correctly was very important). 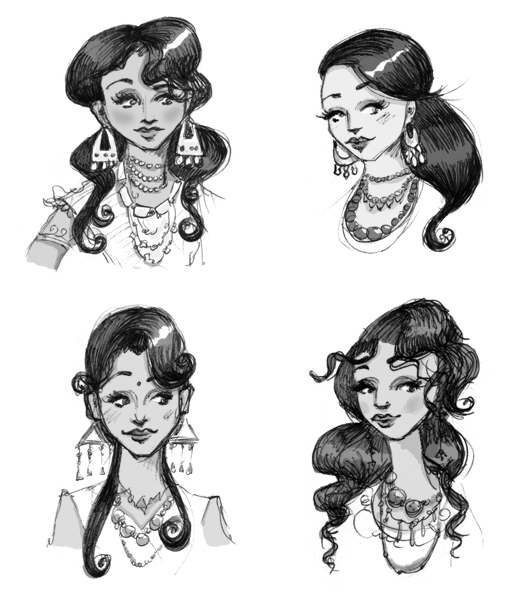 I did listen to Indian music while working on sketches — Pandora radio (www.pandora.com) is great for this! Off the top of my head, I can’t remember particular videos, but I did see, “Koi Mil Gaya,” which was lots of fun. Joy Chu: Do you work same size, or up-size at the same percentage throughout? 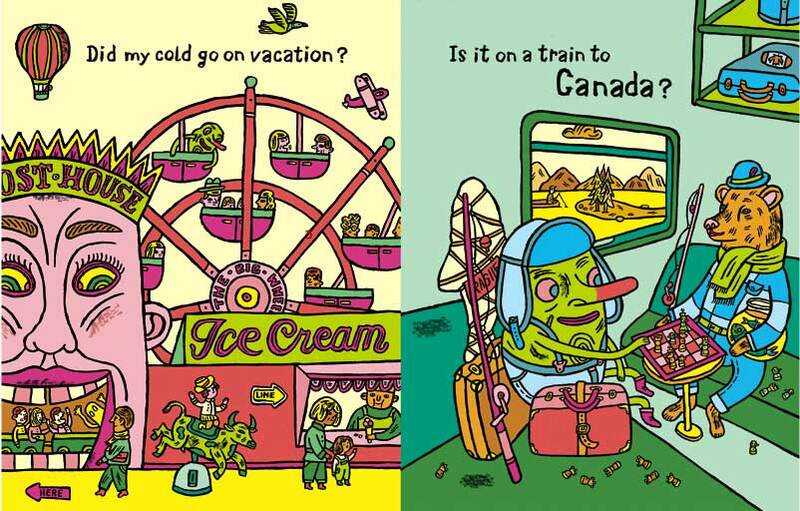 Abigail Halpin:I work the same size for the illustrations. For some of the more complex scenes (like the engagement party), I did draw the work slightly larger (maybe by about 25%), then scaled down in Photoshop. This allowed me to get more detail into the image. Joy Chu: Which books and sites were the most helpful? And Bollywood movies? I’d love to show an appropriate one from youtube, to give some background for our readers. The best friends’ love of Dolly is the central driving force, after all…. Abigail Halpin: I used Flickr a lot for photo reference, mostly to get a sense of the look and feel of India. 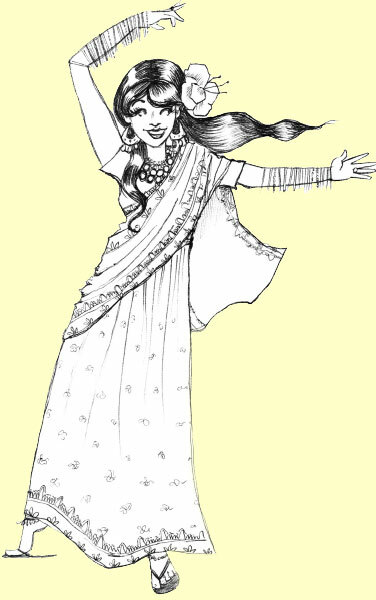 I looked at lots of Indian movie stars online in an attempt to capture Dolly’s glamor. One book that I really liked was an old Time Life photo book of India — I think it’s out of print, but there were so many gorgeous photographs of the country in that. Joy Chu: It was a lot of work. I counted roughly 12 full pagers, 9 large spots, 9 small ones, plus a full-color wrap piece for the jacket. Abigail Halpin:It was a lot, but everyone I worked with at Simon & Schuster was terrific. Also, Uma’s story is a total gem and offered so much fabulous material to illustrate. Joy Chu: Awesome stuff, Abigail! Joy Chu: I’m enjoying The Grand Plan to Fix Everything tremendously! I love the spirit of the text. Its voice is as light as a Bollywood musical — despite the serious issue of two BBFs being split apart by a continent! Your picture book “Out of the Way! Out of the Way” was what first attracted me to your work. Your bio states you travel back-and-forth between your home in Aztec, NM, and India. Do you also live part-time at the Vermont College of Fine Arts (where you teach), or is this for a short-residency type class? Now that’s a lot of traveling! 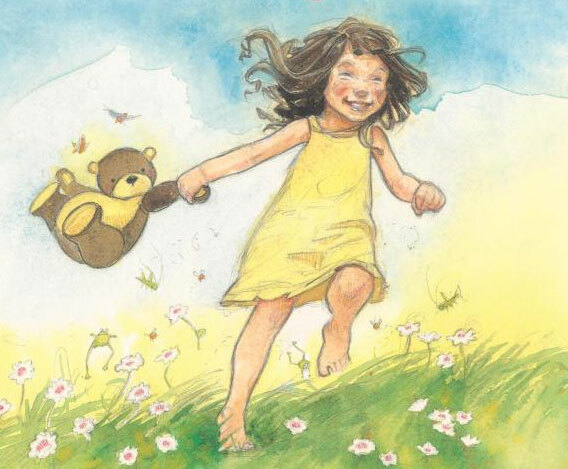 Uma's picture book, "Out of the Way, Out of the Way"
Uma Krishnaswami: The MFA program at VCFA uses a low-residency model, so everyone’s on campus twice a year for residencies. The rest of the work is done through mentoring, with up to five students assigned to a faculty advisor. Even so, it is a lot of traveling, but that’s just the nature of this work, I think. So many children’s writers and illustrators travel to speak in schools. I do some of that as well, but not nearly as much as some people I know. 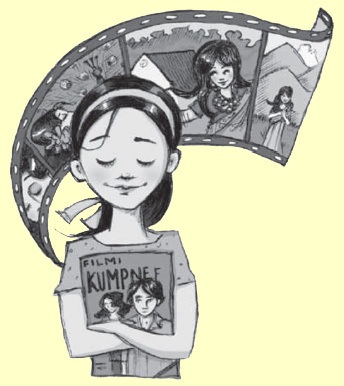 Joy Chu: I love how you combined the elements of what’s important to an 8-12 year old girl’s life — best friends; movie fans sharing girly stuff; hints of first love; new friends — while giving us a window into Indian culture through their crossed paths with a movie star. What inspired you to use a Bollywood actress as its fulcrum? Uma Krishnaswami: I guess I was looking for something that Dini could be passionate about, something that could simultaneously unite a pair of friends and bridge a geographic divide. Bollywood movies felt quite natural. Also, I was amused by the notion that Dini could be resentful about having to go to India and leave behind a Bollywood dance camp — in Maryland! Uma Krishnaswami: I’m sure she is, although I didn’t deliberately merge real movie stars to create her. If I had to choose, I’d say she’s “Shabana Azmi meets Gracy Singh.” She can do the wide-eyed roles. She’s beautiful. She’s got flair. But she’s also smart and she often marches to her own, eccentric drumbeat. And she can dance. I think she may be Gracy’s long-lost sister but don’t tell anyone! Joy Chu: I find myself visualizing your characters simply by your descriptions of their actions. And I love their musical sounding names! And the chirpy Priya. Uma Krishnaswami: Thank you. They didn’t get that way all at once, I can tell you. It took many, many revisions to find the right combinations of traits and longings, not to mention the circumstances that bring them into play. Some names dropped right into place for me. Dini was Nandini for a long time and she wasn’t working as a character. Then a student of mine with that name told me she’d wanted to shorten it when she was younger. “To what?” I asked. “Dini,” she replied. I was hooked. It was the perfect name and it came with its own back story of the differences between generations. What could be better? I asked my student for permission to use both her name and her childhood motivation, and she was gracious enough to agree. Priya the chirper — I love Priya. She can do what I can’t–whistle. Chickoo Uncle’s name also came from nowhere and fell right into place and it dictated who he became in the story — a mild-mannered, nervous young man with a silly nickname. 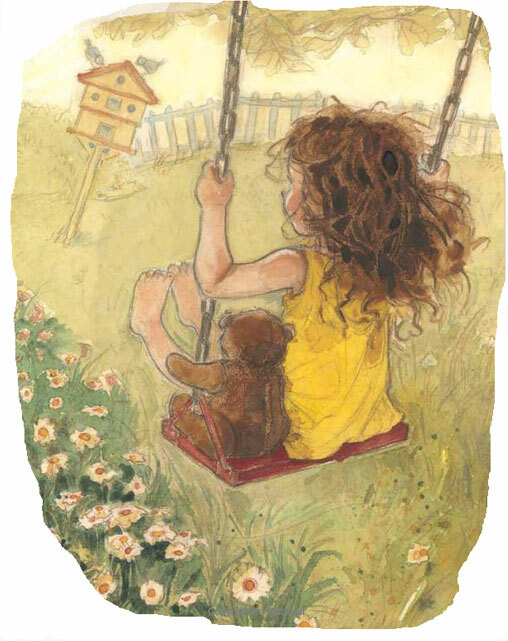 Joy Chu: Did your editor (Caitlyn Dlouhy) share any of Abigail’s preliminary sketches with you? And did you provide feedback to help her along? Uma Krishnaswami: Yes, it was quite a wonderful process. My comments weren’t that extensive. Abigail Halpin really captured the energy of the girls right away. In fact in the last rounds of editorial work, I put up a photocopy of one of her sketches in my office. 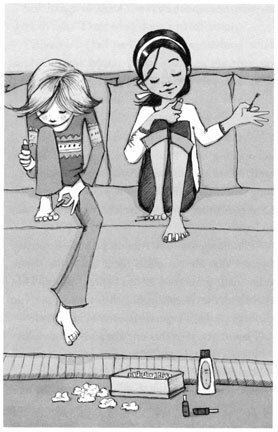 It was the one of the two girls together, painting their toenails. When I got stuck I’d look at them and they always helped me get back to the emotional space I needed. I did have a few comments on the jacket sketch, to do with place names on the map and the location of the fictional town of Swapnagiri. It was wonderful to offer these suggestions and then to see them translated into images in the next round of the art. 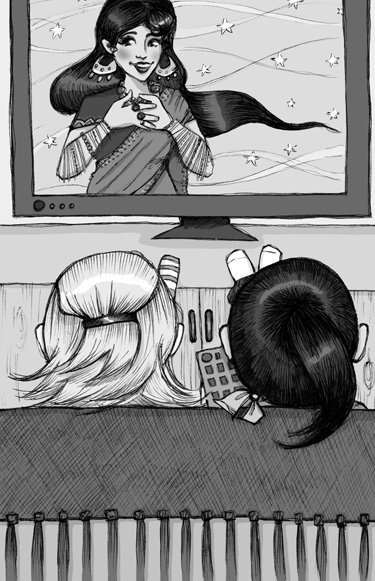 Joy Chu: I’d love to include a youtube clip of a scene from a typical Bollywood movie that both Dini and Maddie would love. This is to get our readers “in the zone”, so to speak. Would you recommend a link or two? Or of the musical sounds that Priya imitates? Uma Krishnaswami: How about the title song from Chak De India? Or the rain dance from Lagaan? But you have to remember that Dolly is fictional and the movies she makes wouldn’t be typical Bollywood. Dolly may be gorgeous but in her movies, she’s also a tough cookie. She brings villains to justice, she rights wrongs, and she tells the guys who want to marry her to take a hike. That’s not your average Bollyplot. But the dances and the glitter — Dolly has those too. That’s what draws the girls in, but I’d like to think it’s the social justice themes, the sense of the world being in the end a good place, that make them loyal fans. Joy Chu: Did you provide material for the book trailer? Uma Krishnaswami: Yes, I started out thinking I could do the trailer on my own, so I actually plunked in the video footage I took in the Nilgiris last time I was there, and pictures from Takoma Park that I’d gotten through people I knew. I played with title slides a little, but at some point my iMovie abilities just hit a wall. The transitions were clunky, and I was spending way too much time trying to get things to work and ending up with a big mess. I also knew there was no way I could add a music track and make it work. So I asked my son if he’d help and I am most grateful that he came to my assistance. Joy Chu: Your son Nikhil Krishnaswamy, spells his last name differently from yours. Is there a reason? 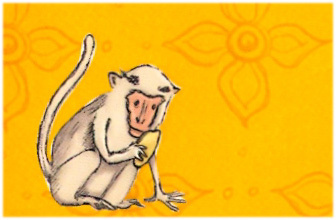 His spelling matches that of your Out of the Way, Out of the Way illustrator (Uma Krishnaswamy), another coincidence. 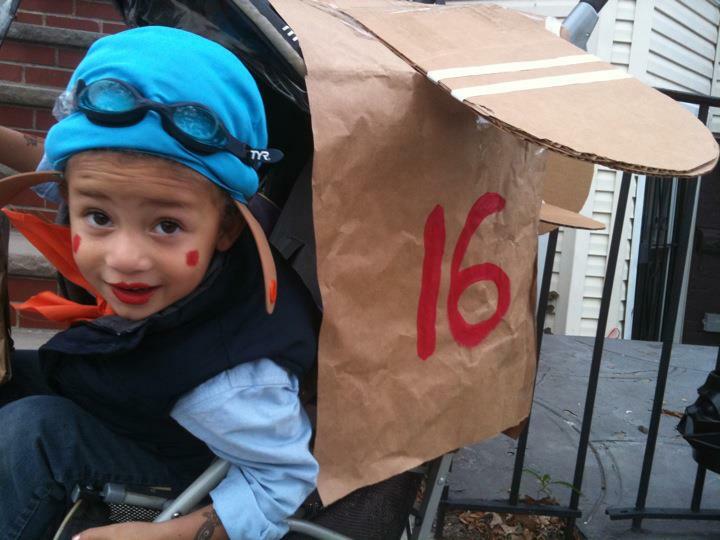 Uma Krishnaswami: Yes, my husband spells his last name with a y, and Nikhil does too. Yes, yes, I married a man with the same last name. No, no relation. I kept my letter “i” because I’d always figured I wouldn’t change my last name when I got married. But illustrator Uma (the one with a “y“) — that was pure coincidence. Joy Chu: I’m so pleased that you are available to answer questions about the book trailer — which is delightful. Did your mother surround you (and your family) with stories while you were growing up? Nikhil Krishnaswamy: Yes. 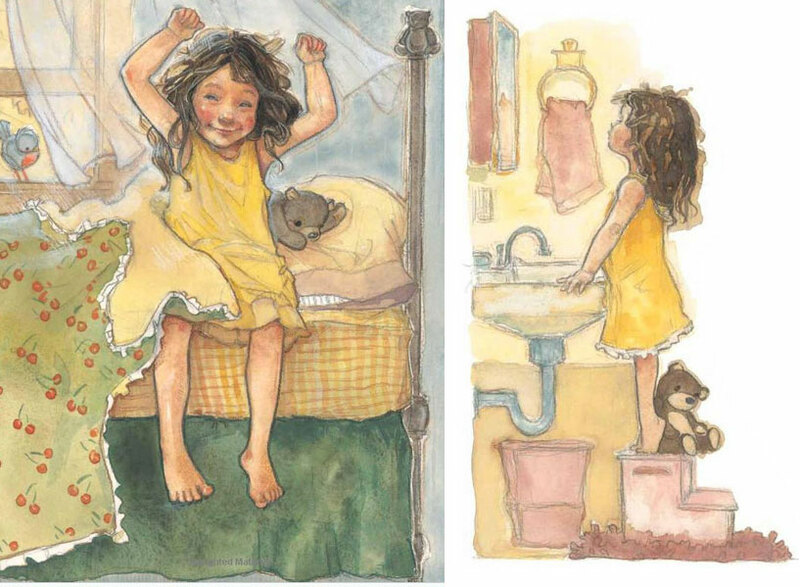 Even before she got her first book published (when I was seven), our house was full of books. Both she and my father read to me regularly until I was about eight or so, starting with picture books/early readers, and eventually full-length novels. Joy Chu: Where are you currently located, and what do you do during regular hours? Nikhil Krishnaswamy: I’m currently living near Columbus, OH, but I’m moving to Boston this fall to start my Master’s degree. My last job was as a video game programmer at a company near here (my bachelor’s degree in is computer game development), but due to complications with Microsoft, my contract on the project ran out, so I’m between jobs now. I’ve got a few iPhone/iPad games in the early design stages, and a few other hobbyist projects I work on during the day for the time being. Joy Chu: Where you were raised? Nikhil Krishnaswamy: I was born in Bethesda, MD and lived in the DC area until I was ten, when my family moved to northwest New Mexico. I went to college at DePaul University in Chicago between 2005 and 2009, and I’ve lived here in OH for about eight months now. Joy Chu: Was this your first iMovie? Nikhil Krishnaswamy: No. I’ve been working with video editing for years now, and I’ve long since lost count of the number of projects I’ve done. I started with it in my freshman year of high school, and have since used various software packages—often iMovie (because it’s free for Mac users), but also Adobe AfterEffects and Final Cut, to name a few. Though I have no formal training in video editing (aside from a few classes in college), it’s something I enjoy and that I’ve been told I have a pretty good eye for. This is, however, my first book trailer. Joy Chu: Uma, your website provides an Activity Kit chock full of discussion topics plus a recipe. How was this all pulled together? Uma Krishnaswami: That was thanks to the wonderful team at Blue Slip Media . Sarah Shealy and Barbara Fisch worked with a curriculum consultant and a designer to put that kit together. I did check the content and I added a little something to that recipe. Barbara and Sarah are PR goddesses in my estimation. Barbara Fisch: PR Goddesses? You mean we have to change our business cards?? But seriously, I think the authors and artists do the hard work. We just find ways to spread the word. Joy Chu: What a terrific 21st century concept for book promotion — The blog tour! Barbara Fisch: It is really a collaborative effort. 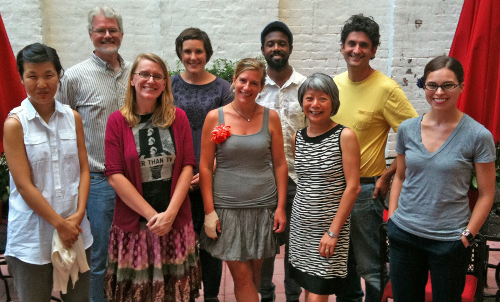 Uma has such a terrific network of friends and colleagues who contribute to the conversation about children’s literature. 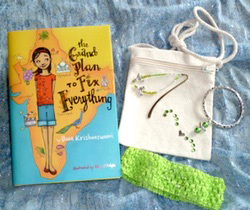 Three lucky Grand Prize winners will each receive one copy of The Grand Plan to Fix Everything along with a starry assortment of bangles and trinkets that Dolly Singh, famous famous Bollywood movie star, would adore! An additional 3 runners-up will receive a copy of The Grand Plan to Fix Everything. To enter, send an e-mail to GrandPlanGiveaway@gmail.com. In the body of the e-mail, include your name, mailing address, and e-mail address (if you’re under 13, submit a parent’s name and e-mail address). One entry per person and prizes will only be shipped to US or Canadian addresses. Entries must be received by midnight (PDT) on 6/30/11. Winners will be selected in a random drawing on 7/1/11 and notified via email. Here’s a book that shares an aspect of the modern family: When we must go off to our work-a-day lives each week. 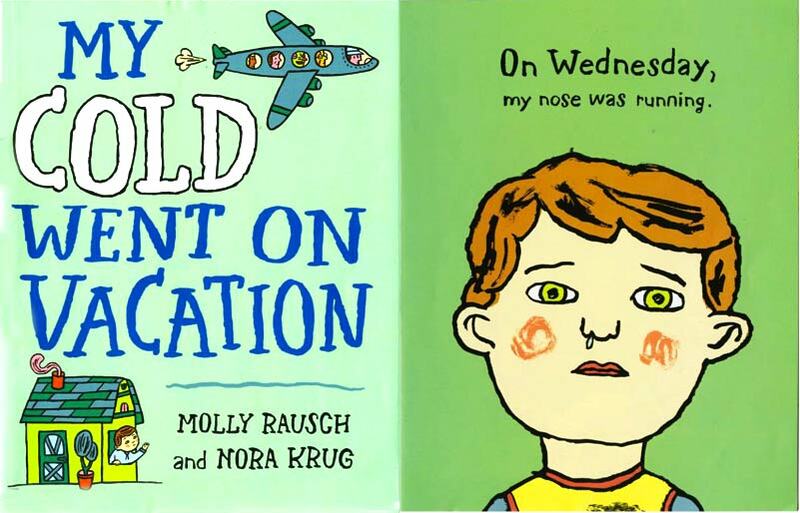 Monday is One Day is a welcome addition to the library of bedtime read-aloud classics for busy families of all types. 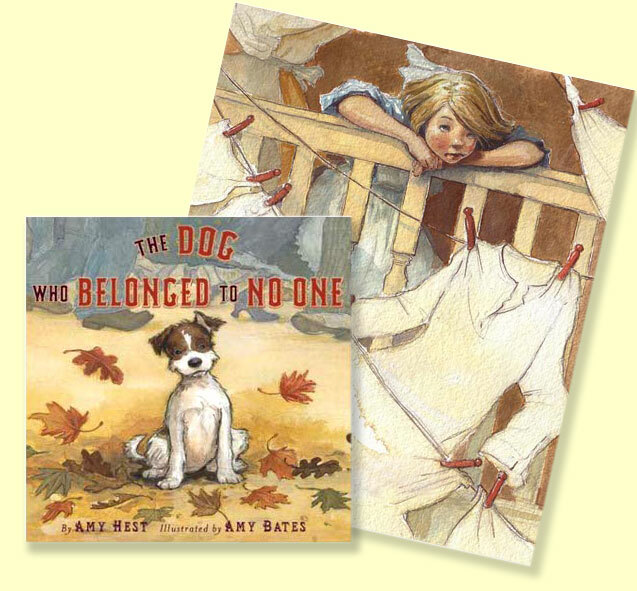 Arthur A. Levine, noted publisher (the Harry Potter series), editor (Goodnight Gorilla, Officer Buckle & Gloria) and children’s book author, was inspired by his own experience as parent to write a book that addresses workday separation. 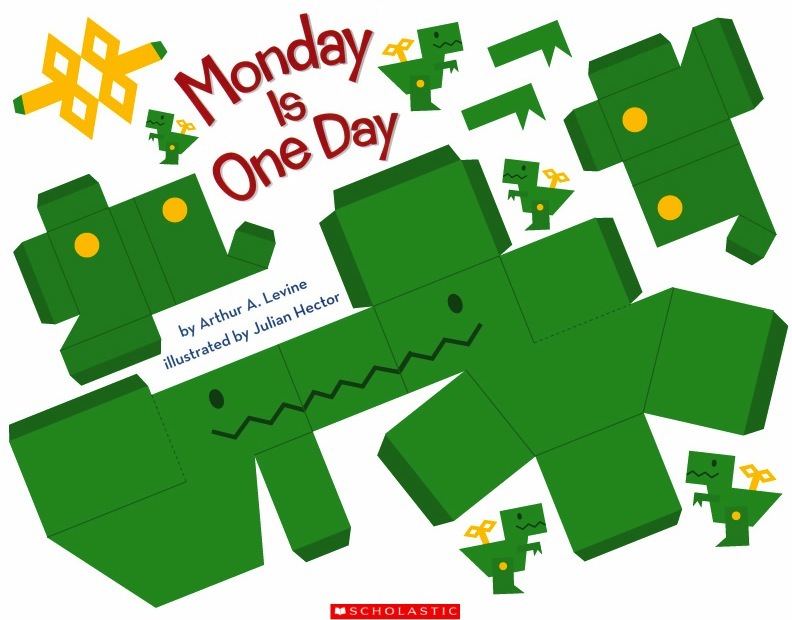 Monday is One Day reassures both child and parent that a warm reunion will always happen, too. 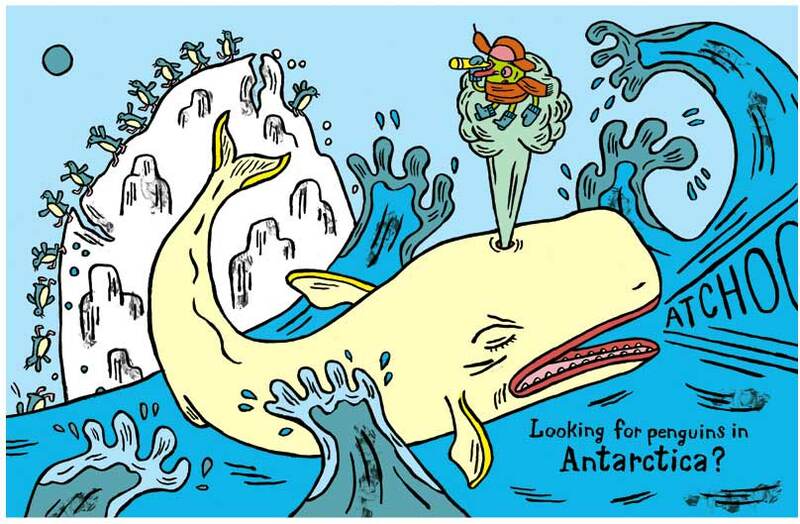 The charming illustrations are by Julian Hector. Check out his website and blog. And go here to download and construct a toy from Monday is One Day. We pause for a moment to bring you this flash of jazz via Tim Egan‘s book trailer for his series of early readers, featuring a very funny duck accompanied by his straight man, Dodsworth. Here’s one for Dan Yaccarino’s upcoming book, All the Way to America. His animation experience enables him to conceptualize cinematic trailers using iMovie.